Titanium Castings (UK) Ltd, (TCUK) has developed new materials and techniques for manufacturing precision, high duty valve and pump castings for strategic manufacturing programmes. These enable short lead-times to be achieved for fully certified, production volumes, prototypes, one-offs or low volume castings, to specified procurement standards. The company has also achieved a commendable delivery record for full-rate production of defence components, demonstrating its capacity and capability to manufacture significant volumes of commercial castings. 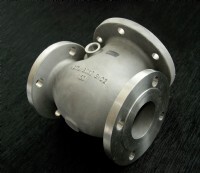 Castings can be supplied to a maximum weight of 26kg, in lead times of 10 to 12 weeks, with a dimensional accuracy in the range of ISO 8062 CT4 - CT6 and a surface roughness average, Ra, in the range of 2.5 - 7.6μm (100 - 300μin). Weight savings of up to 25%, and machining savings of up to 45% can be achieved when compared to alternative manufacturing processes. The manufacturing facilities are accredited to ISO 9000 and EN/AS 9100, with radiography and vacuum heat treatment facilities being certified by NADCAP. Titanium Castings (UK) Ltd is a wholly owned subsidiary of Castings Technology International, but operates independently with its own Board of Directors. It is the only manufacturer of titanium castings in the UK and is located on the Advanced Manufacturing Park in South Yorkshire.